Virtual Private Servers Or Dedicated Servers? When you first set up your website, you'll need to choose a server to host the pages. Though shared servers are typically the most economical choice, more businesses are choosing to use virtual private servers or dedicated servers because they offer greater protection and more speed. To determine which server is best for your website, it's important to understand the benefits and features you'll receive with each type. A virtual private server offers many of the same benefits as a dedicated server for a lower cost. If your website is hosted on a virtual private server, you are technically sharing the server space with other users. However, your site is partitioned off onto its own portion of the server so that you have greater privacy and security. Because the server is shared, you'll pay less than you would for a fully dedicated server. Virtual private servers generally place greater restrictions on users. Though you'll have freedom to install most software programs, you might encounter strict limitations on the amount of disk space and RAM you can use. They also have slower processing times, which can affect the speed at which your website loads. By choosing a dedicated server, you'll enjoy full control over every aspect of your hosting. Many dedicated servers are not managed, which means that you will be responsible for updating and installing programs on the system. However, most hosting providers offer management services for those who are not technically-inclined. With a dedicated server, you'll have greater flexibility, extensive storage space and quick processing times. Of course, dedicated servers are more expensive than virtual private servers because you receive so many additional features. 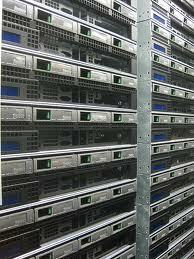 A dedicated server costs more to run, particularly if you have to pay an additional fee to have it managed each month. If your physical server is stored at your business and managed by someone from within your company, you'll also need to account for the maintenance costs associated with keeping it on the premises. To determine which server is best for your website, outline what you need from your server and what you're willing to pay for those features. Dedicated servers are typically best suited for large companies or for businesses who need extreme security and control from their servers. Virtual private servers are a smart option for businesses on a budget, as they offer an option between costly dedicated servers and unreliable shared hosting. Whether you choose a virtual private server or a dedicated server, your business will benefit from the greater storage space and security.